David Wentworth is an artist, illustrator, and storyteller (his words) that we me at CTN Animation Expo. According to his web site, “David has worked for clients like Dreamworks, Sony, and Amazon animation, and is advancing his career as a concept/character artist and comic artist. He creates in a wide range of mediums, both traditional and digital. 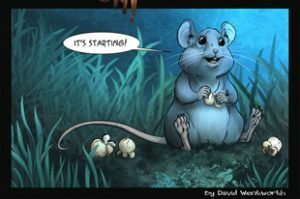 In addition to animals he enjoys science fiction, writing, history, theatre, biology and languages in his art.” In addition to his illustration, he’s created an on-line comic called Blue & Jay which should be of considerable interest to Furry Fans. He even creates puppets!